¶ Text & Typing: Press and hold on letters to see optional characters. On iPad, flick up on the Comma key to insert an apostrophe. To reject an incorrect predictive typing entry, tap on the suggestion. The iPhone will generally insert apostrophes in common contractions (but watch its and it’s). ¶ Sync or swim: Chris explained the finer points of syncing and how to set up a Google account with one or more calendars that can be shared (with appropriate privileges). ¶ Information management: In Address Book, select contents of a Smart Group and choose File: New Group from Selection to place those contacts in a standard group. (iDevices won’t sync a Smart Group.) Organize your bookmarks into folders in Safari. iDevices respect folders and will keep a selected folder front and center after you choose it. ¶ Email: Gmail IMAP offers a number of advantages including filtering messages into mailboxes, really good spam filtering, and its ubiquitous accessibility. Chris showed us how to set up Gmail as a reliable primary account with other SMTP servers for sending in case Gmail fails. ¶ Jailbreaking and Unlocking the iPhone: Chris explained the advantages and disadvantages, and where to get apps that aren’t in Apple’s App Store. ¶ Travel Tips: Data roaming is EXPENSIVE (turn off in Settings: General: Network). Use web mail. Consider free or cheap unlocked phone when you get there. Use phone for Wi-Fi web browsing only. Consider installing travel-related apps like a currency converter, unit converter, or phrase book. An unlocked phone can be used overseas with an inexpensive local SIM card, a jailbroken phone can be tethered to your Mac for free, to use the phone as a modem. ¶ Troubleshooting: Chris gave us a simple list of troubleshooting procedures and some settings to conserve battery power. 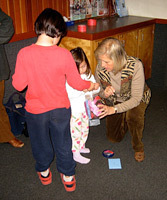 November 18, 2010: SBMUG’s November Holiday Festival and Pot Luck. Folks brought their favorite dishes to share with their fellow MUGgers. After the Questions & Answers there was fun, music and festivities to kick off the winter holiday season! October 21, 2010: Gary Woods, tech columnist for Casa Magazine, gave us a quick history of his journey from the Apple IIe to the iPad, with an overview of his favorite iPad software. A Santa Barbara native, Gary attended USC and graduated from California Institute of the Arts in 1972. He’s written for Mix Magazine, Electronic Musician and others; written music for television series; arranged for Michael Jackson; and has had a technology radio show. For the last 15 years he’s been in real estate. When bugets for music dropped in the early 1980s, computers came into use. Gary used MIDI controllers, Commodore 64, Atari and Apple IIe computers, among others, for composing until he got into real estate in the mid 1990s. Next came PCs he built himself running DOS, then Windows 95 through XP on Dell computers, finally getting back to the Mac with a G4 running OS 9. A MacBook replaced his defunct Windows laptop, and the Dells were replaced by 24” and 27” iMacs. After Gary got his first iPad he handed it to his wife. She liked it so much she wouldn’t give it back, so they have two iPads now, and they sync their calendars with Mobile Me. Gary prefers to use a wifi keyboard with the iPad in landscape orientation, rather than using the iPad dock. He uses Dropbox for storing files from the iPad “in the cloud”. PrintCentral ($10) enables the iPad to use your printer by way of your Mac or PC. 1Password is a Keychain-like app for storing passwords. (LastPass works in Windows environments too.) The Realtor.com app shows homes for sale in any city or in your current location on a map. ChicagoAgent from Chicago Title “puts amazingly accurate good faith estimates and precision net sheets” onto your iPhone or iPad. DocuSign for electronic signatures and tracking of documents. Sonar Ruler estimates distances by sonar (like from one wall to the opposite). Heading to LA? Beat the Traffic (free) shows current traffic conditions, like while you’re on the road passing Camarillo. Penultimate is a handwriting and drawing app that lets you draw with your finger. iAnnotate PDF lets you mark and highlight PDFs, which you can save and email. AlwaysOn PC gives you a Linux desktop in the cloud, works with Open Office etc. LogMeIn (one-time fee) works with Mac and Windows. Verizon MiFi 2200 Mobile Hotspot is a 3-client wireless ‘router’ for your car. Here’s an index of Gary’s tech columns written for Casa Magazine Santa Barbara. September 16, 2010: Fred Marschak, Professor of Earth and Planetary Sciences at SBCC and longtime SBMUG member, gave us a presentation entitled “AstroMac”. Fred’s presentation was a lot of fun and truly fascinating. It began with a short “field trip” outdoors to the Museum courtyard to view an iridium satellite flare crossing the sky at 7:24 PM. After the viewing we went back inside where Fred led us through his list of favorite “AstroSites”, demonstrating some of them on his iPad and iPhone, in addition to showing us Google Sky (part of Google Earth). Fred’s “favorites list” is available at his web site astroprof.com. Also available on his site are 10-minute videos that he uses in his Santa Barbara City College courses. 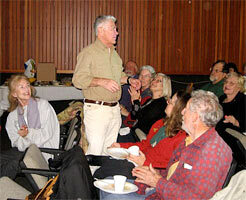 Fred also explained the local (Goleta) connection to LCOGT / Las Cumbres Observatory Global Telescope Network, a private foundation building a global network of telescopes for scientific research and education. One telescope is located on UCSB’s Sedgwick Reserve. Fred suggested some favorite astronomy apps for iPhone, iPad and iPod: Starmap, Planets, iEphemeris, SoLuna, MoonMapLite, and Tides. August 19, 2010: We had another fun SBMUG Experts Demo night. Everyone wanted to exchange info and suggest helpful apps they felt others needed to know about. Even the experienced users learned something new. Jim Tinsley and Robert Smitheram led the Question and Answer session, with additional comments by Ed and Kenzie Togami. Jim also did an excellent job of showing us how to set up Skype on his laptop, and Ed Togami, from outside the building, called Jim’s laptop from his iPhone using Skype. Harold Adams demoed Apple’s iLife applications to an enthusiastic crowd, while Marjorie Wilser, Ed Togami and Richard Eigen teamed up to demo their iPad apps. Robert Smitheram and Kenzie Togami each had groups of folks gathered around them watching demos on their hand-held iDevices. The room was abuzz with people chatting and networking! 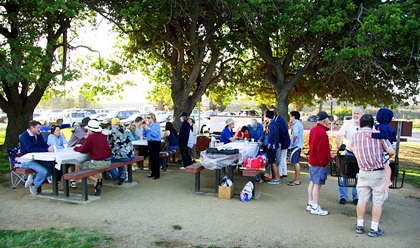 Plenty of food and schmoozing at the beach picnic. Starting a backup with SuperDuper! June 17, 2010: SBMUG president Jim Tinsley showed us how to set up and use MozyHome’s on-line backup storage, one of five “cloud” backup services reviewed this month by MacLife Magazine. Jim also compared features of the various services, some of which work only with Intel Macs while others work with PowerPC models too. Most offer 2 GB of storage for free and charge for larger amounts of storage. Mozy’s preferences include shceduling when to do backups and how long to wait when the computer is in use, what bandwidth to throttle to and when to throttle, and which folders and files to include or exclude from backing up. Pia Oliver showed us how to set up and use SuperDuper! for copying to a local external drive. The external drive can be “bootable”, so it can be used as a startup drive if the computer’s internal drive fails. Before the initial backup, use Disk Utility to erase the new drive and reformat it as Mac OS Extended (Journaled) to make it bootable. 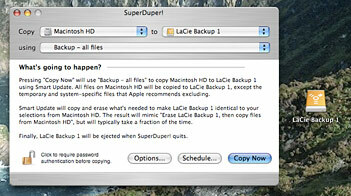 SuperDuper!’s easy-to-read help manual explains how to set various options (including scheduled backups and backing up over a network), how to recover from a disaster, and how to test new updates with a “sandbox” partition. Remember, disasters can happen to backups too, so it’s good to have at least 3 copies, in 2 different media and in 2 different places. For example, a SuperDuper! bootable backup copy, a Time Machine backup, and a backup to “the cloud”. 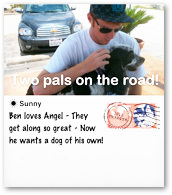 May 20, 2010: SBMUG member Harold Adams described his road trip to Florida with his 17-year-old son Ben, a MacBook, a 3G iPhone and a WiFi iPad, to deliver a client’s dog to her new home. The trip took them through Goodyear Arizona, New Mexico, Van Horn Texas, a visit to the Alamo, The Riverwalk in San Antonio, Baton Rouge Louisiana, Mississippi, Alabama, Lake City Florida, and finally to West Palm Beach. The trip took six days, traveling about eight hours and 480 miles a day. Harold showed us a slide show of images made with the iPhone camera while they were on the road and taking roadside breaks, including scenery and greenery along the way, the Alamo, and even some fast food places! With only WiFi connectivity, the iPad worked in some hotels and not in others that didn’t offer it. (Same with coffee shops, of course.) Sometimes it was necessary to get the internet on the iPhone. And sometimes WiFi worked on the iPad but not the iPhone. WiFi service, which usually covers only a few rooms or a building, was always free and without password on this trip. 3G (as used in cell phones) works out in the wild as well, but there are fees involved. 3G cell service on the iPhone was good the whole way. Where there was WiFi, the iPad was good for email and the web. A 3G iPad would have been better for connectivity and driving directions. 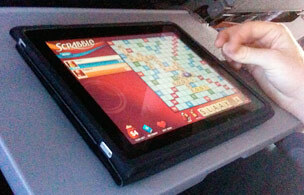 On the return trip, the iPad was great for playing Scrabble on the plane, passing it around from one player to another. Harold and Ben watched a Seinfeld episode on the iPad. It looked much better than the seat-back screen on the plane. When not on the road, Harold is the force behind Santa Barbara Life – SBLIFE.COM and Adams Technical Media Services and Macintosh consulting. 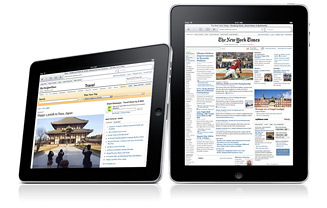 April 15, 2010: This month, three SBMUGers gave us a hands-on look at their new iPads! Jim Tinsley began with the basics: the controls and connectors, including the switch that keeps the orientation from flipping when you’re reading on your side in bed. The iPad has no phone technology so it doesn’t do instant messaging, but it can make and receive calls with Skype. Synchronizing with an iPhone makes it easy to install the same applications on the iPad, even newer versions if available. Though the touch interface is the same as on the iPhone, the iPad’s larger screen makes it practical to work with documents, revealing a new paradigm: using your fingers instead of a mouse! Harold Adams showed us a game that uses the iPad’s motion sensor as the controller, and parts of videos and a Bugs Bunny cartoon. We could hear the sound easily from across the room. Harold keeps his iPad, iPhone, MacBook and iMac all synched with MobileMe, so a calendar entry on any one of them shows up on the others. He showed how a copy of USA Today looks just like the print edition, and how easy it is to select an article and read it. Once the latest edition is downloaded it can be read anytime even when there’s no network access. We also had a look at the iPad versions of iPhoto and Mail, which take advantage of the large screen size (five times as many pixels as on the iPhone). Richard Eigen showed us the iBook and Kindle reader apps. iBook displays your downloaded books on a bookshelf, and reading a book on the iPad is very much like reading the paper kind, even in the way pages turn. There are controls to change type face, font size and screen brightness. The Kindle reader is similar, but works with books bought from Amazon.com. Apple has thousands of books available for free. Richard showed us one of them: Winnie the Pooh, with illustrations! Roger is a retired chemistry professor from UCSB and teaching is obviously his calling, as he explained all sorts of things very clearly and well. We also learned a bunch about local birds, and had a great time! Roger’s new book Birds of Cachuma Lake is available now, and you can order copies here. February 18, 2010: SBMUG member Randy Reetz showed us some of the amazing things you can do at home and in the office in his presentation “FileMaker – A Database for the Creative Soul.” FileMaker Pro can do much more than help you keep track of your books and CDs. It also does audio, video, emailing, dialing, and stand-alone kiosk apps! Randy showed us a very impressive variety of projects he created, including a recent project on local history and the visitor center kiosk, all done with FileMaker Pro. 1. Make at least one copy of your personal files, test your copy, and do this often. Even backup drives fail, houses burn down, equipment is stolen, so more than one copy stored in more than one location is better. 2. Organize — know what’s been backed up and where. 3. Archive for long-term storage (on CDs or DVDs, for example) old files you want to keep but don’t want taking up space on your computer. Software to make regular backups more convenient (so you won’t procrastinate): Carbon Copy Cloner, SuperDuper (both highly regarded, can make bootable backups); Prosoft Data Backup; Dantz Retrospect. Utilities: You can make a zip archive of your backup with DropZip, which comes with Mac OS X (in the Applications > Stuffit folder). Backup media: External hard drives (Firewire is faster than USB), internal hard drive in a spare slot, CDs & DVDs (good for archiving, but limited capacity and slow compared to hard drives), USB memory sticks (convenient and fast, but can wear out with lots of use), iPods, network backup services (MobileMe iDisk, Jungle Disk, Mozy, CrashPlan.com, DropBox.com). Another idea: Send a compressed archive as an attachment to a friend, or even to yourself, to make copies available in more than one place.